We are going to talk to you about the problems that come along with silver fish. You are going to learn about what they are, what damage they cause and then how we can help you destroy the silverfish with our services. To give you a simple description of silverfish; they are small, wingless insects which inhabit humid environments. When you find a silver fish, you can generally find that they have a silver, metallic color coating and they have antennae at the end of their tail. What this does is it gives them this fish-like appearance. In fact, they are fish-like to the point that they move in a wagging motion; similar to the way that a real fish would move. ​As we said, silverfish inhabit humid environments. Generally the humidity is around 75-95% in order for silverfish to thrive. Examples of humid environments include sinks, showers, water heaters and places where there are leaks. It is in these places that you should likely to see a silverfish pop up nearby. Silverfish tend to inhabit dark environments as well, because they are nocturnal in nature. However, you are more likely to find them in damp places in the dark. 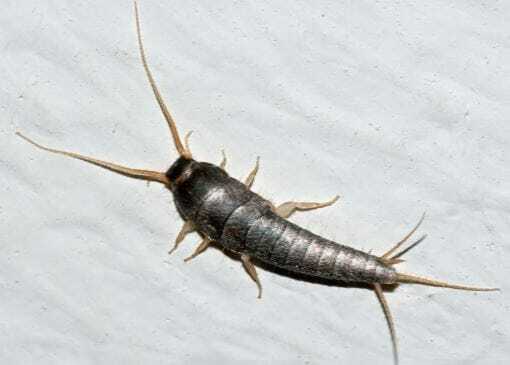 One other thing to note about silverfish; is that if you spot them, you might notice that they can have tiny, pepper like feces around them along with the feeding damage that occurs with silverfish. That is an indication that you have one in your home. Potential damage that silverfish can do to your home. The interesting part about silverfish is that they consume carbohydrates. This is very important, because silverfish generally consume a specific type of carbohydrate called polysaccharides. Examples include starches and some adhesives. This, therefore, means that they will eat almost anything that contains polysaccharides. Adhesives found in duct tape and in wallpaper, book bindings, paints etc. Any item in your home that has this carbohydrate, will be destroyed by silverfish. No matter where the adhesives are, they will eat it all up. Not only do they go for adhesives, but they are known to attack materials such as cotton, polyesters, shampoo liquid etc. Interestingly enough, they can also be found in unopened in food packages. The great news though is that silverfish are not a hazard to human or pet health. They do not carry diseases and cannot spread disease. So in that sense, you can survive with silverfish in the home. However, you will be spending a fortune on repairs for your home because the silverfish will be eating away things such as wallpaper, damp clothes and spreading their pepper like feces all over the home. what can you do about silverfish? ​Here is what you can definitely do about silverfish – call us. Our silverfish extermination company has many years’ experience in getting rid of all types in damp places. Not only that, we can repair the damage that has been done to some parts of your home. This is how we will get rid of the silverfish for you. When you call us, we will come around to inspect whether there are silverfish in your home. We will look in as many places as possible where it is dark and where there is a lot of humidity. Once we find the silverfish, we will identify where they have come from. Then we will use our extermination techniques such as applying chemicals and pesticides to affected areas to kill silverfish. Repairs and payment for our services come afterwards. So if you think that you have a problem, then call us as soon as possible and we will get to the problem quickly.